"Cuenca. Impressive views to the valley in the heart of historic Basin." 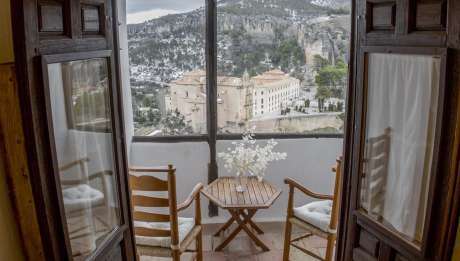 Posada San Jose charming hotel is situated in the heart of the old historic quarter of Cuenca, in a 17th century building. It inn matches the unique town of Cuenca. Its sculpted portal and old door tempt you to walk in and admire the magnificent views over the Huecar River Gorge, which the Posada´s privileged location offers to its visitors. Once inside you find a multi-levelled house with staircases leading up and down, twisting and turning, something different from the mass-produced hotels. The rooms are comfortably furnished in keeping with the architectural features of the building. Some of the rooms have balconies from where to enjoy the splendid views. Hiking to your needs in the Serrania de Cuenca. Possibility to book adventure travel activities. Relax in the spa of Solan de Cabras at 80km. Enjoy the culture. Wandering through the alleys of the old town of Cuenca (monumental heritage). Visiting the famous hanging houses, window Devil, Enchanted City, Alleys of Majadas ,Torcas of Palancares and Cañada del Hoyo or Laguna de Uña. Refering the common areas, they are lined with antique furniture and curiosities. In its dining room you can taste typical local dishes, tapas.. .
Do not do anything!. Inside you can go back in time and enjoy the quiet that is enjoyed among its centennial walls. El hotel estaba muy bien y la amabilidad de los empleados.